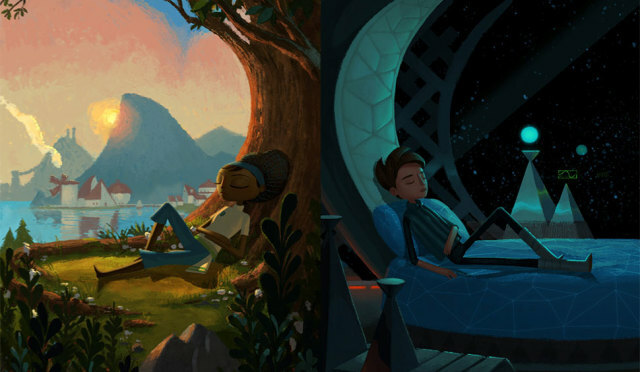 Yesterday, Tim Schafer’s Double Fine studio delivered on their long awaited, Kickstarted adventure game, Broken Age. Or the first half of it at any rate. Now that the original big time video game Kickstarter has ostensibly delivered, how are people reacting? Well, that time has come, and Double Fine’s Broken Age, Act 1 is live on Steam, and reviews are… well, mixed. Of course, the gaming press is generally glowing with praise (what, with Broken Age being a return to a classic genre, with a unique and lovely art style, great voice acting, and brimming with themes that game writers can point at and go, “it’s not all Call of Duty! Games are art!,” who’s surprised? Not me!) However, it doesn’t take too long spent perusing the backer comments to see that the praise is punctuated with a lot of criticism. Frequent backer concerns suggest that the game’s puzzles are too easy, that there is too much story and not enough actual game play, and–somewhat unsurprisingly–that Act 1 is just too short, with most players reporting completion in under four hours. Now, I didn’t back Double Fine’s little adventure (and I’m starting to feel somewhat vindicated, to be honest), but I am very curious as to whether or not people feel that they’re getting value for their investment. While I expect that I will play Broken Age myself eventually, this has and continues to look like Steam Sale fodder to me (to be fair, most indie games feel like that for me). Certainly the project’s midstream hiccups should serve as a reminder to backers and potential backers that experience in the field does not necessarily mean that their money will always be well spent. That said, it’s hard to fault a creator who has (mostly?) delivered the goods. So good on you, Double Fine. Now give your backers the rest of their game.